Why SEO Always Outranks PPC, SEO vs. PPC, Is SEO better than PPC? 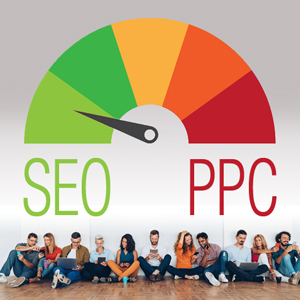 SEO vs. PPC is a decision that should be familiar to any marketing professional with experience working on growing businesses with limited budgets. Ideally, you’d use them both, but that isn’t always viable. Sometimes you have to pick one — and that one has to be SEO. PPC campaigns can absolutely be improved. You can tweak your targeting parameters, alter your copy, change your keywords, and play with various platform-specific features like featured snippets in AdWords or direct buying links in social ads. But once you’ve achieved your preferred setup, the results are going to be steady at best. You polish a piece of content to a mirror shine. The on-page metrics go up as users pay more attention and link to it more frequently. Google rewards the improved metrics with better rankings. The better rankings lead to more traffic. The increased traffic further solidifies the strong on-page metrics. Google rewards the stronger metrics with better rankings (and so on…). You’re not going to see indefinite improvement, of course, because competition gets hotter the higher you’re ranked. Sooner or later your content will be pitted against something more comprehensive with better metrics and it will settle in a particular position, but if your content is good enough, that could be a really impressive and high-performing position. Speaking of improvements, you can look at PPC campaign improvements as existing in a bubble. You can improve the ROI of your campaign by 400%, but it won’t leave you in a better position when you stop the campaign — all of the traffic will instantly dry up, leaving you in roughly the same space you occupied to begin with. What’s more, if your content isn’t fit for purpose, it might achieve very poor on-page metrics, ultimately leaving you with less traffic when your campaign concludes. SEO, however, is all about looking to (and investing in) the future. Something as simple as clearing up broken links, getting rid of duplicated content and adding some metadata could fractionally improve your rankings near-permanently. I say near because Google’s algorithm is always prone to change and nothing is ever guaranteed, but you can be fairly sure that any changes that make your site more useful for searchers will be rewarded by search engines in perpetuity. How are results distributed when you do a search in Google? You might get a selection of paid ads, then the first page of results (possibly with some featured data at the side), then a list of subsequent pages at the bottom. If you’re ranking somewhere on page five, AdWords ads seem extremely appealing: find the budget to run some ads and you can appear right at the top alongside some massive retailers. But the ads appearing at the top doesn’t mean that they perform better than the top organic results, because they don’t — quite the contrary. Because users know perfectly well what an ad looks like, they recognize that they’re being sold to with PPC copy, and they prioritize the top organic results above all others. Ad placements are bought, while organic placements are merited, and searchers understand this. As a result, while it takes a great deal more time and effort to achieve page-one rankings for valuable keywords than it does to go down the PPC route, you get superior performance that requires no further investment when you get there. And that’s a prospect that even the most ingenious PPC advertising campaign can never compete with! If your site is struggling to get the traffic you want or need, and you’re looking to a path ahead, you should definitely choose SEO work over pursuing PPC. It’ll take time, but not that long — appearing on Marketing Speak earlier this year, digital marketing lecturer Dawn Anderson noted that (in her experience) Google’s suggestion that you need four months to a year to get meaningful SEO results is about right. The key takeaway is that you’re not looking at an epic SEO quest spanning an entire decade. Find the time today to make some SEO improvements, and within a year you’ll be much better off than if you’d invested that effort in carrying out PPC advertising instead. Most studies show way more people click on the organic results than the ads. To read more about eye tracking, see this blog about How Users Perceive the New Google search results page. Victoria Greene is an ecommerce marketing expert and freelance writer who loves taking an in-depth approach to creating SEO-friendly content. You can read more of her work at her blog Victoria Ecommerce and can be reached at hello@victoriaecommerce.com. Click here to get back to the top of this blog.